Vibrant in both its neon-tinted visuals and characterization, Emily Carmichael’s short film Stryka is a winner due to some bone dry humor and a flagrant upending of the faithful sidekick trope. Aimee Mullins gleefully rolls her eyes (behind excellent alien make-up work) through an existential crisis as the title character, a petty thief who cares for her partner Callen (Rupert Friend) but who longs for the thrill of a larger, flashier score. 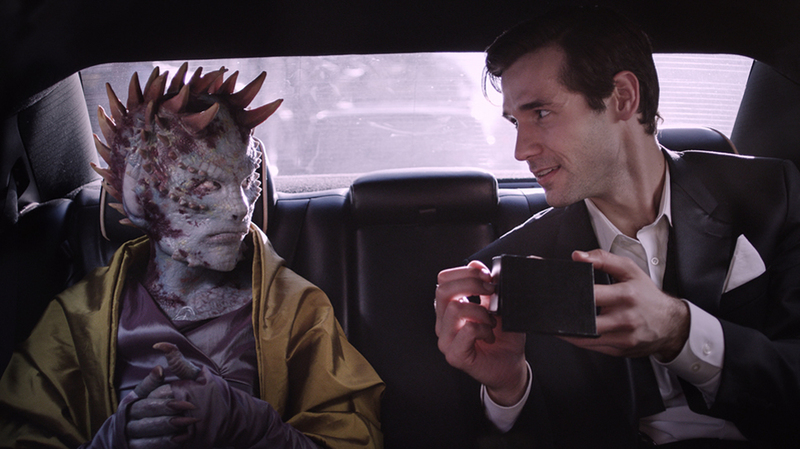 The rom-com undertones are clear here as Stryka shares her frustrations with a futuristic therapist: stick with the unambitious guy who makes her happy or risk what she has for the bigger fish? What’s immediately impressive about Stryka is the balance of its production design, which crafts a clever near-future reality and lays it over present-day New York City streets. A bus floats by without wheels, but we still have to wait for the flashing red crosswalk signal and hope the neighborhood diner makes our toast right.